The combined gold holdings in exchange-traded products declined for a seventh consecutive day while similar balances in silver-oriented funds fell for the first time in three weeks. CFTC reports indicate changes in speculative attitude underway. For the first time since mid-July, such participants did not add long gold positions. Thus, it would appear that the corrective phase that emerged last week in precious metals still has more ground to cover on the lower end of the price spectrum — at least until the Fed gets together for its most anticipated meeting of the year next, week. As regards this morning, the opening metals prices tallies revealed the following picture: gold spot, down $11.00 at $1,329.30. Silver, was down 41 cents to $23.24 per ounce. 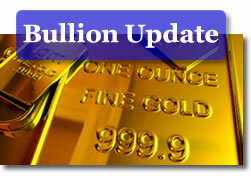 Platinum was off by $2.00 at $1,687.00, and palladium fell $5.00 to $603.00 per ounce. The noble metals complex is likely to get a further degree of support — corrections or not-as US President Obama yesterday called for more stringent truck emission regulations. As to what exactly the Fed will or will not do (or should or should not do) remains quite a contentious matter, even with only one week to go prior to "F" day. Or, is that QE x (insert a number ranging from 1.1 to 2.0 here) day? Hard to tell, as just yesterday, two of the Fed’s own team members duked it out in public, sort of. In the left corner, William Dudley (NY Fed) representing the "doves" argued that while the US central bank cannot act like Harry Potter and simply wave its ‘magic wand’ to rev up the pace of US economic recovery, it can aid in the process with some type of QE. Some see this as a sure-fire way to blow certain bubbles beyond their currently overextended levels. Guggenheim Partners LLC CIO Scott Minerd feels that "The history of the Fed, over the last 20 years, is one of bubble to bubble: one bubble deflates to create another bubble. We are certainly heading into the mother of all bubbles with commodities and gold." We are in one, now, Scott. Ask Mr. Soros. In the opposite corner, representing the ‘hawks’ we heard from Thomas Hoenig (K.C. Fed). Mr. Hoeing warned of the ‘dangerous gamble’ of easing and of the risk of the Fed thereby potentially unleashing a fresh round of "boom & bust." Let’s get ready to…rumble, or…rubble. Only the future will tell, but the present is counting on, say, $500 billion from the Fed next week. The trouble is that the maneuver might not yield the expected outcome and that the economy remains quasi-stalled. "What happens if they bulk up the portfolio by another $500 billion in the next six months and there is no material change in markets or the outlook? Presumably, the Fed will double-down and buy some more, but at some point, people will ask, ‘Is that all there is?’" remarked Vincent Reinhard, the ex-director of the Fed’s Division of Monetary Affairs. ‘Shocking’ (in a most pleasant way) news out of Britain this morning, as the country recorded an economic growth pace fully twice that of what had been expected for Q3. A rate of growth of 0.8% (still down from Q2’s 1.2%) can work miracles these days. It can also put quite a damper on the doves’ plans over at the MPC to accommodate some more, come its own November meeting. Sure would be nice to get a similar surprise to the upside from the US one of these days, as well. For today, what the US markets got was the finding by Case-Shiller that US home prices fell 0.2% in August. The report sent stock futures, gold, and oil down and the dollar higher in a fresh case of "less worser" news coming in as good news. Speaking of news, the one that matters at this moment in Canada (at least as far as the mining industry is concerned) is the fate of Bill C-300. Today is the day when the bill gets its final debate and tomorrow it gets to be voted on. Just last week, a hitherto suppressed and highly damaging report on the industry was leaked by MiningWatch Canada. The report alleges that Canadian mining firms are implicated in four times (!) as many violations of Corporate Social Responsibility as other similar companies from various nations. Kitco News reported that "the report found that Canadian companies have been the most significant group involved in unfortunate incidents in the developing world, more than Australia and the United States. "Canadian companies are more likely to be engaged in community conflict, environmental and unethical behavior…" The PDAC, which commissioned the report last year (but never released it) responded that the findings deal with "unproven allegations" and is "not balanced." Coincidentally, just last week, audiences at the Spokane Silver Summit were treated to a ‘documentary’ titled "Mine Your Own Business" in which the producers attempted to show the ‘good guy’ side of the industry by claiming that such activities bring lots of sorely-needed jobs (and much more) to the areas they operate in. Wonder if the producers of said film have parsed the findings of MiningWatch. Meanwhile, when you have some spare time, you can parse this. The good folks over at Goldletter International have produced some interesting volatility metrics on gold. Worth a serious look. Especially if one has large(r)sums riding on this asset.